I took this photograph below in late January, 1996, while covering the last days of the Cambodian Civil War on assignment for Newsweek Magazine. It’s another of my favorites, and also luckiest photographs, just scanned in on an Imacon scanner. I was standing on the side of Route 57, the main road from the Northwestern provincial capital of Battambang to Pailin, a Khmer Rouge stronghold to the south, when the tank appeared out of the bushes and raced down the road. The image is the final in a series of 5 frames I shot when the tank blew past me, unaware of how close it was. 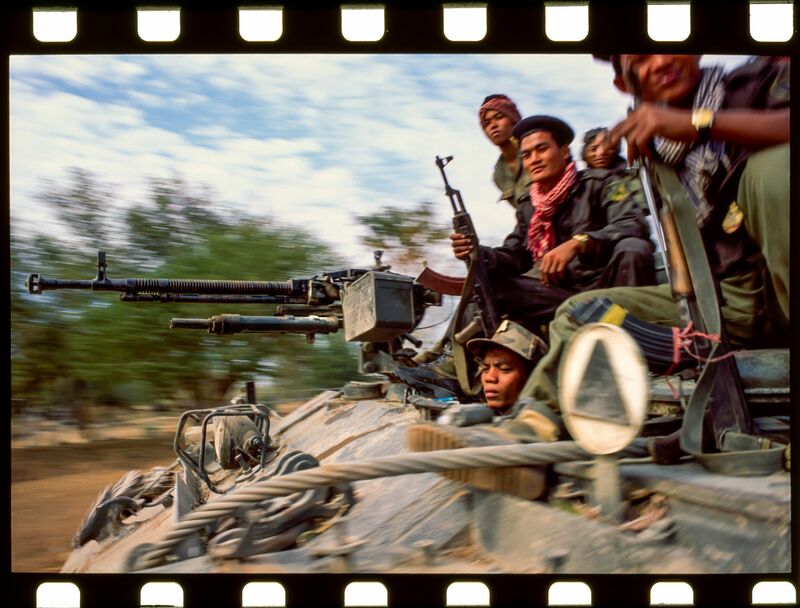 The film was shipped later that week directly from Bangkok to Newsweek and I didn’t see the slides until many months later - somehow my final image in the series managed to frame the tank perfectly. The slight blur attesting to its speed and the sharp face of driver, all make it one of my best, and luckiest images. We didn't have "data" back then attached to our images, my best guess is this was with a 28mm lens, 1/125th second at F11.